Uxmal is located about 78 kilometers south of Merida, on the Yucatan Peninsula. This ancient Mayan city is best known for its beautiful architecture. Uxmal flourished during the Classic Period. Scientist differ on the exact date of its founding. 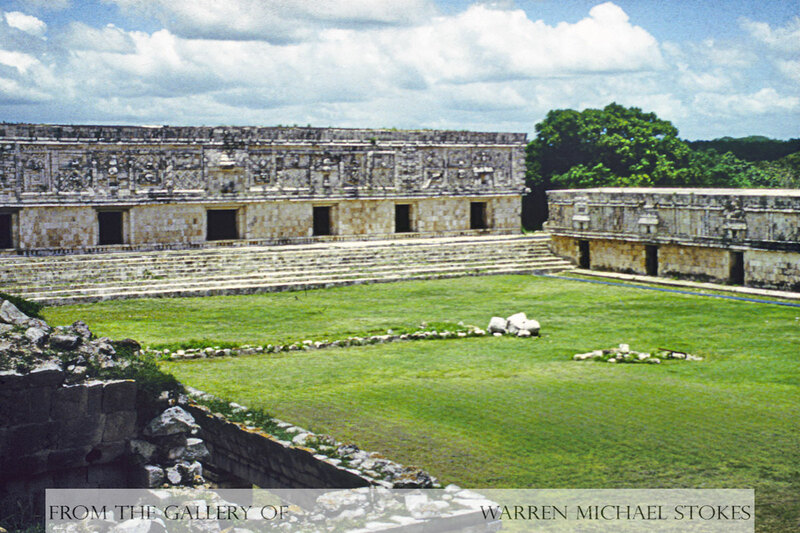 However, Carbon-14 tests by Yale University tells us that Uxmal was probably founded between 500 AD and 550AD. These first occupants most likely arrived from the Chiapas area of southern Mexico. Then, between the years 987AD and 1185 AD, the cities of Mayapan, Chichen Itza, and Uxmal ruled the Yucatan as a triple alliance. This so called “League of Mayapan' brought political stability to the region. However, it did not stop the demise of the Uxmal itself. Much is still unknown about Uxmal and its earliest residents because the archaeologists that have worked at this site have primarily focused on restoration instead of excavation. In addition, the archaeological digs that have occurred have shed very little about Uxmal's past. Uxmal and its ceremonial center flourished in an area that lacked rivers, lagoons, or cenotes. They solved their water problem by constructing a series of cisterns or underground reservoirs. These cisterns which were called “chultunes”, captured rain water. Hundreds of these reservoirs are found in the immediate area surrounding Uxmal. Many scientists believe that the architecture found here is the finest in the entire Mayan realm. In Uxmal, the Mayans constructed many of their buildings in groups in the form of a square. Amazingly, this style of architecture is very close to the styles of the European Monasteries during the Medieval Period. The Nunnery Quadrangle at Uxmal is considered by experts to be the finest example of ancient architecture in all Latin America. It was named the “Nunnery” by a Franciscan priest Diego Lopez Cogolludo who thought that the buildings looked like the religious convents in Spain. Each building was constructed with an odd number of doors, and the center doorways were always larger and more elaborate. The northern building has twenty-two rooms, and it is the longest of the four, measuring 82.70 meters in length. Above each of its doors is a row masks of the God of Rain. In addition to the Nunnery there are several other important buildings at Uxmal. These include the Pyramid of the Magician, the Governors Palace, and the House of Tortoise. There is still much left to be restored in Uxmal, including another square of buildings called the Cemetery Group.